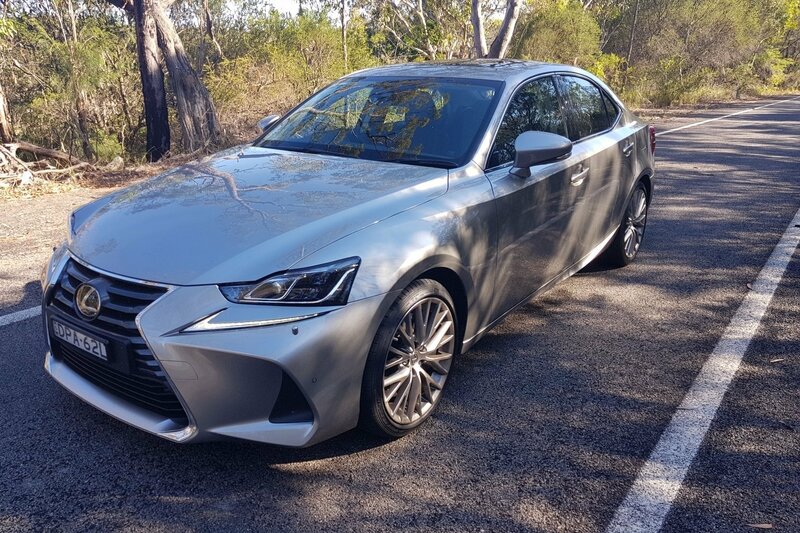 WITNESSING a 2018 Lexus IS 300 at rest, you might take its aggressive style, the pinched grille, prominent air intakes and sweeping body lines as the sign of an uncompromising performance car. But don’t let its looks fool you. 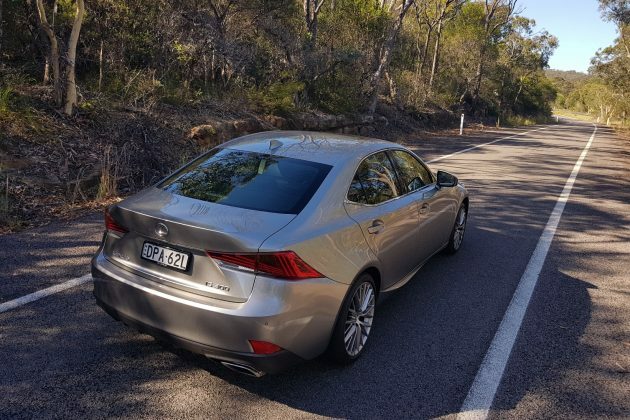 Despite confirmation of its sports luxury aspirations from its refined chassis, the IS 300 is foremost a cruise and comfort machine, with a well honed ride, hushed cabin and generous feature set. The 2018 IS 300 comes bundled with a turbocharged 4-cylinder engine, and is rear wheel drive. But this isn’t an entirely new development, because Lexus has simply renamed last year’s rear wheel drive IS 200t as a 300. What the Japanese car maker has done though is swap out the six speed transmission, in its place a new eight speed automatic that marries with the turbo four, which offers 180kW of power, and 350Nm of torque. The IS 300 is part of a three engine, nine variant range that includes a Luxury, F Sport and Sports Luxury version of each option. These include the IS 300, an IS 300h (2.5-litre 4 cylinder with a hybrid battery system) and the IS 350 (a 3.5-litre quad-cam V6). 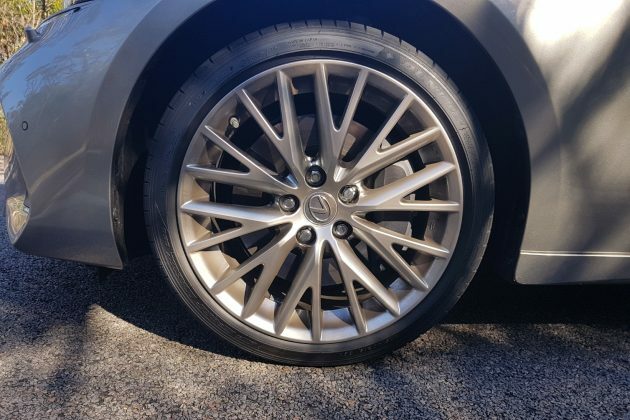 Our IS 300 Luxury came resplendent in Mercury Grey, and presented as a good looking, comfortable and easy to drive vehicle that was definitely luxurious, but was it riveting to drive? Off the line, it’s not so eager, but feels reasonably strong once it gets going, but we found the transmission to be indecisive and laggy, and while we got close, we couldn’t match the claimed 7.6-litres/100km in fuel economy (with 8.2-litres/100km our best). Aptly nicknamed the dentist’s car by one of our team, it’s definitely a swank looker, but it’s slow and heavy, or at least that’s how it feels. The paddle shift system is okay, and we found ourselves using it to help the car find the right gear. 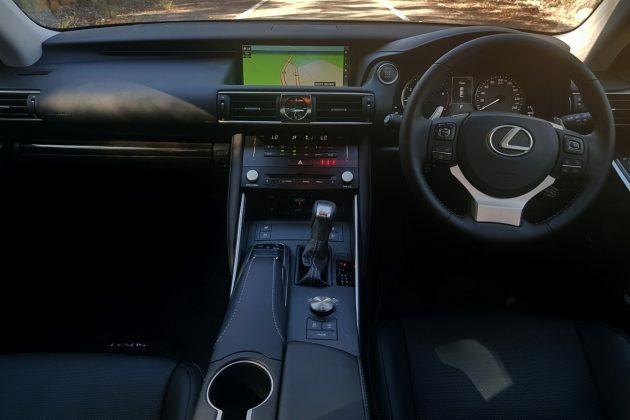 Four drive modes are standard in the IS 300 which include Eco, Comfort, Sport, and Sport+, the latter being more suited to F Sport models but providing the best performance here too, when required (and we stress the when). Putting the car into Eco mode feels a little like being a wet blanket at a party and gives a real watered down feel to the drive, while Comfort is most suitable for daily driving providing you get used to the transmission wanting to lower the revs all the time. Want to hit the motorway or winding road over the weekend? Sport+ keeps the transmission in the lowest possible gear before spiralling towards the red line, but in day to day driving it became annoying because it was so overt in its engine push. The Lexus IS 300 is so, so talented though. A genuine driver’s car when you forget about the engine and gearbox. Handling, grip, steering, it’s all excellent. That’s because the IS 300 has such a good chassis, rigid and well-balanced, with great suspension. The front end gets double wishbone suspension, while the rear is bundled with a solid multi-link setup, with many of the suspension components also constructed from aluminium to keep weight down. Spring and damper rates have been re-calibrated, while front and rear anti-roll bars have been revised to help keep body roll under control. Grip is excellent, and cornering, exceptionally calm, despite its 1,680kg weight. The four cylinder engine works hard (especially on steep hills), but the grunt is more than adequate. The turbo does make power delivery a bit manic at times. It’s not perfect but it is pretty good. Cabin ergonomics also prevent a perfect driving experience. A lack of contouring means we had trouble finding a comfortable grip on the steering wheel, and while we like the driver and front passenger sides being closed off, race car style, it’s a bit claustrophobic in a road car. The 2018 Lexus IS 300 comes with an abundance of the features you’d expect including blind spot sensors, radar cruise control, lane departure warnings, emergency braking, auto high beam and auto windscreen wipers. This end of the market is where we usually learn about emerging technologies too, but there is nothing really new or outstanding amongst the feature list, and that’s okay, the IS 300 is still very much keeping up with the competition in most areas. The IS 300 Luxury is also equipped with a world class Mark Levinson 15-speaker sound system. It sounds magnificent and gives you complete control over media inputs and sound modes to match your taste. The rest of the interior exudes the highest of quality, style and attention to detail in every corner. Like all Lexus cars, you can really tell how much thought is put into making sure every surface is designed and manufactured to perfection. We love the look of the simple yet elegant instrument cluster too. The black background is so dark, it’s almost as if you’re looking into endless space, and the dial needles are hovering in thin air. It’s a very nice touch. 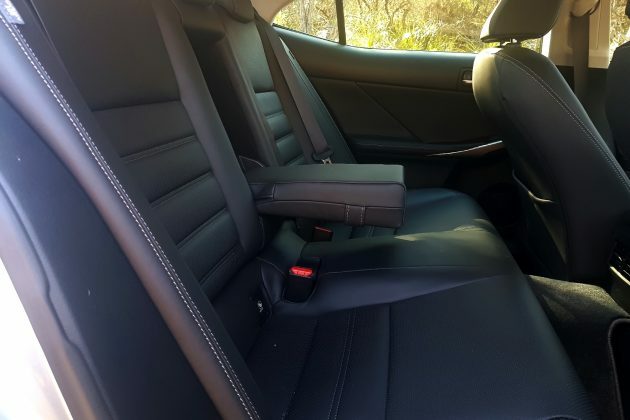 The front seats offer lounge room level comfort and at the same time, are supportive when taking corners fast. For larger guests, side bolstering may feel a tad intrusive, especially around your, um, bottom. The centre console sits quite high next to you as well, which makes you feel like you’re sitting in a bobsled. If you like to feel an airy and spacious existence in your car, spare some attention to the seating position. The ‘Remote Touch Controller’ pad for the media unit rates a mention here too, for all the wrong reasons. It’s such an awkward tool for selecting and clicking items we found ourselves avoiding it where possible. A downbeat inheritance of previous IS models is the rear occupant space. It may not be important for most, and maybe Lexus has done this on purpose, but it has only improved slightly from previous generations. On the plus side, boot space is exemplary. Luggage is easy to load because of a low boot lip, and there’s 480 litres of room back there, with a space saving spare wheel helping to bump up that number. The IS 300 is a worthy adversary to its German mid-sized rivals with great handling and good looks, though it’s not quite at the same standard in terms of cabin refinement. But it does have the edge in terms of value for money, and generous standard features. Is it just a dentist’s car, then? Absolutely not, optometrists will love it too. 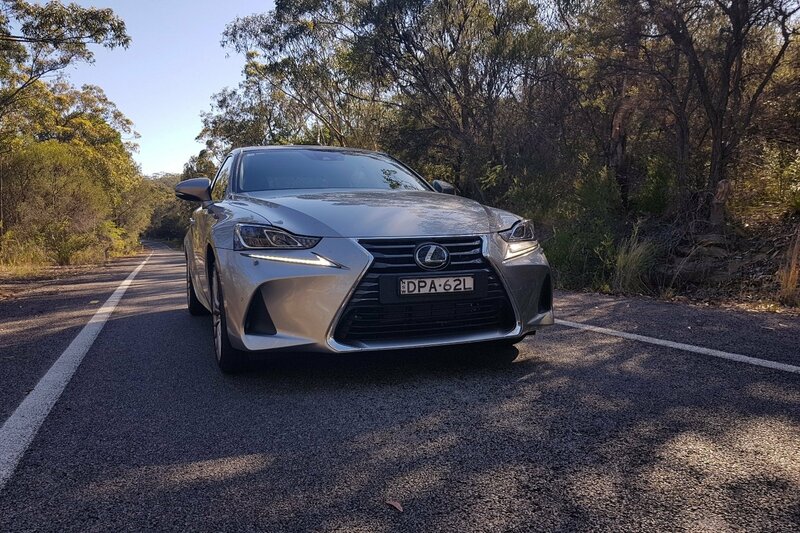 As well as Mercury Grey, the 2018 Lexus IS 300 is available in Premium Silver, Sonic Quartz, Titanium, Onyx, Graphite Black, Vermilion, Caliente and Deep Blue. Our 2018 Lexus IS 300 Luxury was provided by Lexus Australia. To find out more, contact your local Lexus dealer. Pros – interior finish; handling; technology. Cons – lacks grunt; squishy rear seat; front-end looks. Just got mine and a competent, comfortable car. Like a Lexus. If you want something else go elsewhere. JAGUAR Racing has today announced the first entrant in its i-Pace eTrophy global electric vehicle racing series, with three time IndyCar champ and Indianapolis 500 winner Bobby Rahal and his team, Rahal Letterman Lanigan Racing, taking up first spot on the grid, with the championship starting in December 2018.